Fanatec's CSL Elite Starter Pack for Xbox One and PC is their entry level bundle, including several of their lower end components. Despite being entry level, this is more of a mid-ranged system in the Sim Racing world. Black Friday came around and Fanatec had the CSL Elite Wheel Starter Pack for Xbox One and PC on sale for 40% off. 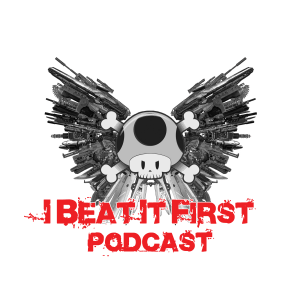 If you listened to our podcast or have followed me, you know I happen to own a 91 Mazda MX-5 Miata that I do my best attempt at drifting with, but I don’t happen to own a sim racing setup to hone my skills off the track. Needless to say I rectified that with this Black Friday deal. A week later 4 boxes showed up from Fanatec containing the CSL Elite Wheel Base, the Xbox P1 Steering Wheel, The CSL Elite Pedals, and the load cell kit I added on to add a clutch pedal. The packaging Fanatec put into their products was top notch, and this was clearly evident on the box containing the wheel base. As you open the flaps on the top of the box, you are greeted with the message “Straights are for fast cars. 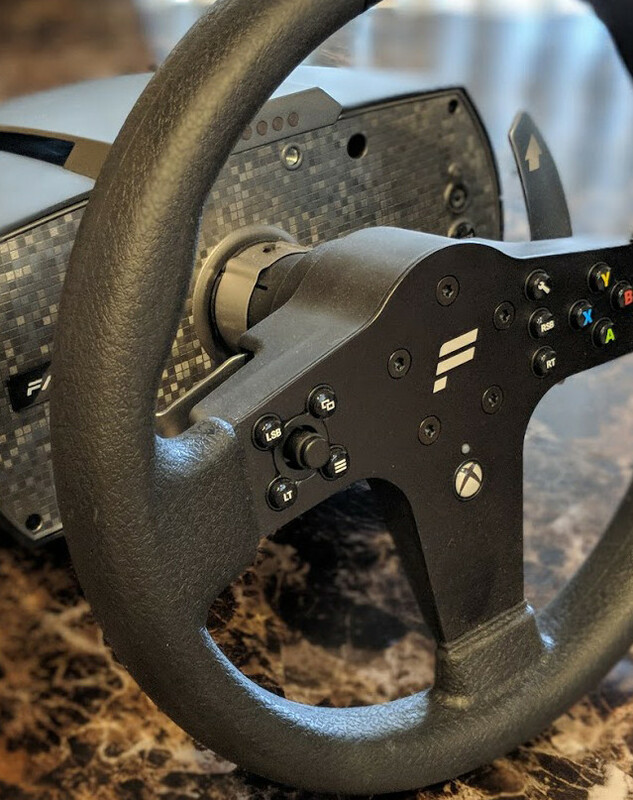 Turns are for fast drivers.” That sets you up with what you are getting, as the CSL Elite wheelbase has 6Nm of torque gives it more power than a Logitech or Thrustmaster set up, while not quite as high as Fanatec’s higher end Club Sport wheel base. The P1 wheel attaches easily to the wheel base, sliding into place and then tightening a set screw. The pedals take a little bit more work to set up. Each pedal requires 2 bolts to attach it to the all metal base, with plenty of mounting holes for you set up your ideal spacing. All the tools are included, and require you to use a wrench to hold the nut in place on one side of the base as you tighten the bolt down from the other end, which can be a bit awkward in practice as you try to hold the base and tighten in down. The CSL Elite pedals normally come with just 2 pedals, the accelerator and brake pedal. The brake pedal comes with a foam insert for the switch, simulating the resistance of an actual brake and does a decent enough job. Add the load cell kit as I did, which is a must for the drift sim rig I’m attempting to assemble, and the brake pedal becomes the clutch pedal. You replace the foam insert with the standard insert present in the accelerator pedal. Both of these offer 12-bit resolution, which allows to you modulate the throttle quite nicely. The real gem though is the brake pedal you get, with 16-bit resolution and actual resistance. The pedal measures force rather than travel and can be adjusted to your liking. The new brake pedal is fantastic in feel but requires you to secure the base, as any hard braking will send it sliding. The load cell kit also requires you to replace the load cell by removing the 4 screws and installing the new one, allowing you to connect all three pedals to it with the included cables. The only further setup required was to connect it all together with the require cables, attach the base to my desk with the included clamp, plug it into my PC and download the latest firmware. After the firmware is downloaded, you are ready to go with PC or Xbox One. The Wheelbase itself was ready to go with my Xbox One right out of the box, however the firmware allowed the pedals to be recognized as well. From there, I was able to fire up Assetto Corsa on my PC and start preparing for Desert Meihan, a local event put on by The Track Society where the recreated the Meihan Sportsland layout on Bondurant’s skid pad. If you’re not familiar with the course, it’s a famous drift track in Japan. Meihan includes a nice long wall and very tight sections. On top of that we’d be hot lapping the course layout, essentially running tandem trains. I have never driven Meihan, or even been to Japan for that matter, so my new sim setup and Assetto Corsa would be my introduction. 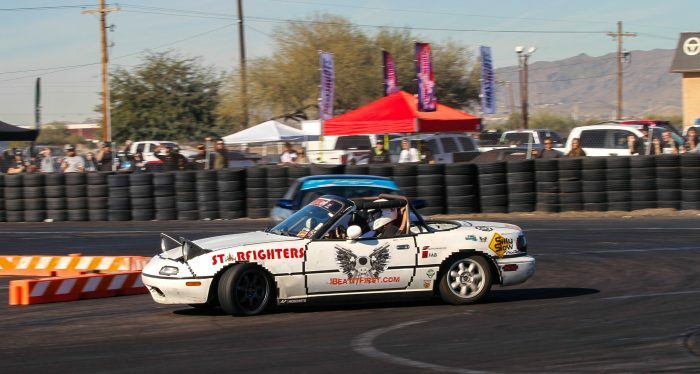 The week leading up to the event, all I did was run the track with a NA Miata to learn it. The 6Nm of torque the wheel base provided was plenty, as it took some force from me to overcome it at times, and it felt great. 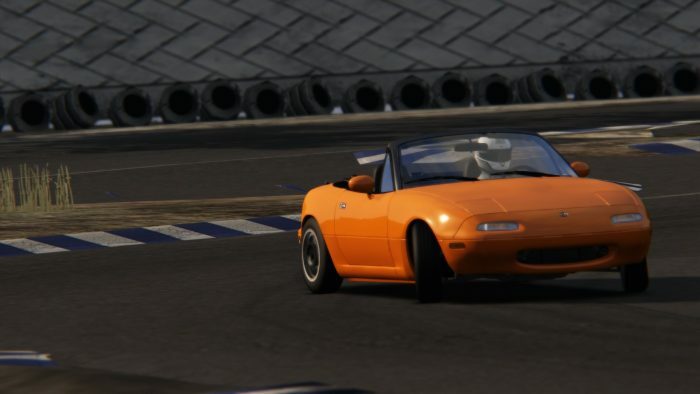 It took some time to learn how to drift with a sim setup, as the NA Miata I was using wasn’t quite set up like mine, and not ideal. On top of that, being a sim setup, I didn’t have the feeling of the car sliding around in my seat, requiring the wheelbase to make up for that. Adjustments are required going from sim racing to the real world, and as my friend John Landy said, it’s easier to go from sim racing to real life than it is the other direction. Sim racing, or sim drifting in my case, allows you to work on skills at a fraction of the cost it would take in the real world, and work on different techniques. Most importantly in my case, it allowed me to learn a course I’ve never been to prior to running the identical layout, and keep me thankfully out of the wall. After the event had passed, I hooked it up to my Xbox One to have a go at Forza Motorsport 7 and Project CARS 2. Both games worked with the wheel, with the in-game wheel mimicking the CSL Elite wheel. Driving felt natural and the control over just using a controller was a very welcome addition. I could attack the corners with much more finesse, adjusting my steering angle with precision and modulating the throttle. Using different cars was also realistically felt through the steering wheel. This was extremely noticeable in Project CARS 2 while driving Mad Mike’s RADBUL 4-rotor twin turbo beast of a Miata. The wheel actually allowed me to drive the car, as the wide angle kit makes it extremely difficult with just a standard controller. On top of that, the car is unruly and best suited for drifting. Driving such a light weight drift car with over 1,000hp leads me to the limitation of my current set up, which lacks a dedicated e-brake, or shifter. Luckily, Fanatec’s ecosystem allows me to rectify that, as they offer an analog e-brake and a gated/sequential shifter. 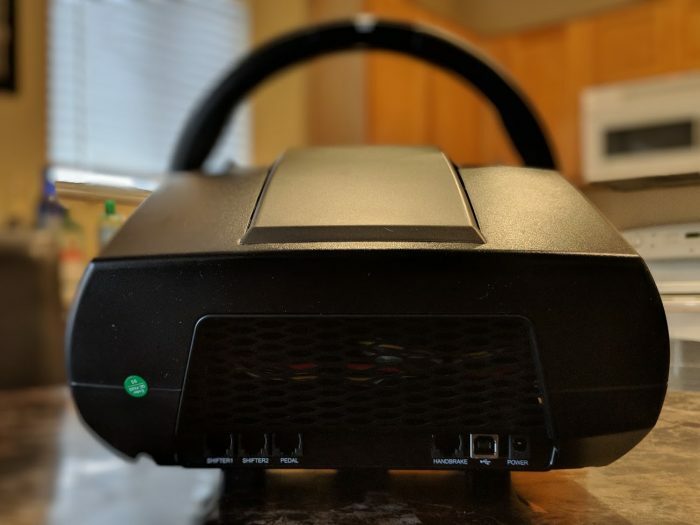 These options aren’t cheap however, as is Fanatec’s catalog, but the build quality and experience with the CSL Elite shows, they might very well end up being worth it. The CSL Elite is a great entry point into the ecosystem, as in addition to adding those, I can also swap out wheels, upgrade the pedals, or upgrade the wheelbase down the road, and everything will still work together. 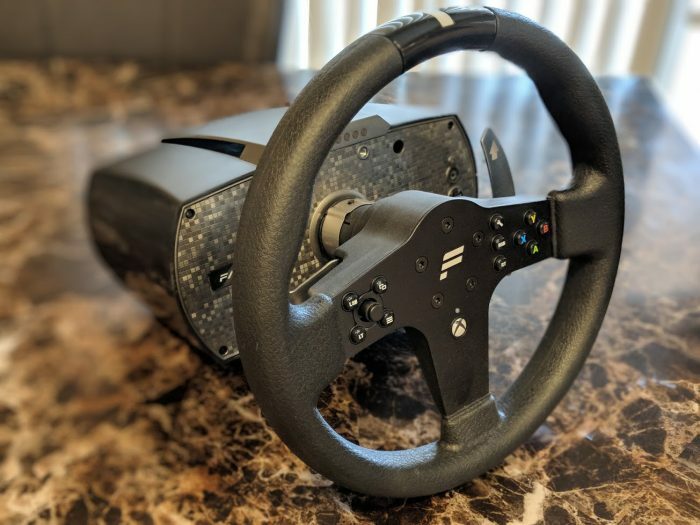 They are even working on a quick release system with NRG so that I could potentially use the actual wheel on my drift car on my sim rig, taking them between the two in a matter of seconds. 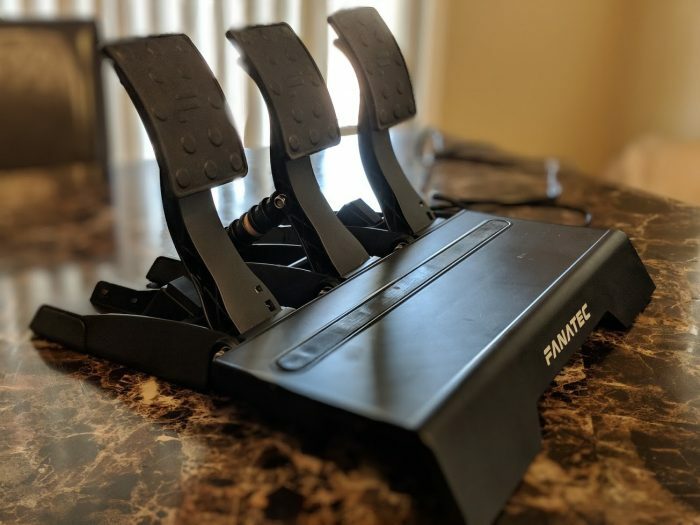 In the past people would have to mod their setups to get a proper drift sim set up, but Fanatec is making modding of the system not needed, and I look forward to where it’s going.